(Nanowerk News) Minimalism is an increasingly popular lifestyle choice that encourages individuals to decrease the overall number of possessions owned and live more simply. According to minimalist philosophy, the reduction of unnecessary clutter enables one to live a more functional and purposeful existence. IMP-IMBA Group Leader and CSSB scientist Thomas Marlovits*, in collaboration with colleagues from Massachusetts Institute of Technology (MIT), discovered that a minimalist approach can also be applied to complex biological systems, such as the type III secretion system. The findings of this collaborative study have been published in Nature Communications ("Control of type III protein secretion using a minimal genetic system"). The type III secretion system (T3SS) is a needle-like molecular machine found in gram negative bacteria that transports pathogenic proteins from the bacteria to the human host cell thus initiating infection. The proteins in this system are tightly regulated and the regulatory elements of TSS3 vary greatly depending on the surrounding environment of the bacteria. For example, Salmonella, bacteria which cause food poisoning, secretes its pathogenic proteins into human gut cells. “The question we asked ourselves is: Can we remove all of the regulatory elements from this complex biological system and re-build (refactor) the needle complex using basic genetic principles?” explains Marlovits. The type III secretion system (T3SS) is a needle-like molecular machine that gram negative bacteria use to infect cells. To accomplish this, scientists from MIT used synthetic biology to recreate the Salmonella needle complex. Using a bottom up approach, coding and non-coding DNA was replaced or altered with synthetic parts and the scientists were able to create an ultra-simplified ‘genetic island.’ The functionality of this island was then tested in laboratories in both Boston and Vienna using conventional bio-chemistry methods. The Marlovits lab then used electron microscopy to visualize the integrity of the entire system. The development of this simplified TSS3 reveals that none of the intrinsic regulatory features of the system are required to generate a functional needle complex and can be exchanged for others. Removing this regulatory “clutter” has not only resulted in the discovery of essential functional roles played by internal start site and small RNA in but has also unveiled key insights regarding the regulatory elements themselves. Regulation, while not directly involved in function, may exist to ensure the efficient utilization of cellular resources and could also increase the number of environmental conditions under which TSS3 can function. The refactored TSS3 could serve as new tool in biotechnology. 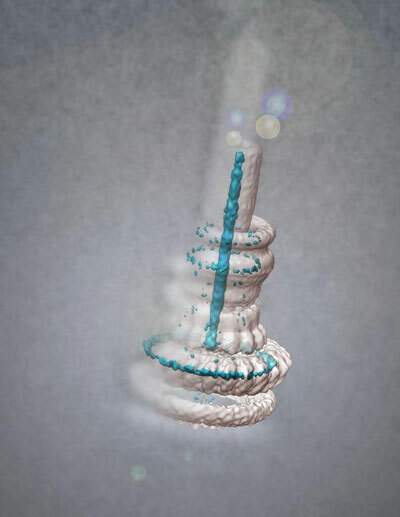 This simplified needle complex could be inserted into other bacteria and then turned-on via a built in regulatory element that acts as a molecular switch. This minimalistic approach to understanding complex biological systems could become an essential new tool for scientists at CSSB. “Understanding how the mechanisms of host pathogen interaction impact biological systems is one of the main goals at CSSB. This new approach provides us with a unique way of looking at systems that will help us discover novel elements,” stated Marlovits. *Thomas Marlovits is a joint group leader at the the Research Institute of Molecular Pathology (IMP) and the Institute of Molecular Biotechnology (IMBA) in Vienna. He is also affiliated with the Centre for Structural Systems Biology (CSSB), the University Medical Center Hamburg-Eppendorf (UKE), and the ‘Deutsches Elektronen-Synchrotron’ DESY in Hamburg.